Ukraine was confronted with an unprecedented economic and financial crisis during 2008-2009. That crisis has until recently been compounded by a highly unstable political situation. The European Union, Ukraine's neighbours and the international community have been concerned about possible repercussions of these developments on the stability of the whole region. The February 2010 presidential elections brought more political stability and Ukraine's economic situation markedly improved as well. In this context, the Austrian Ministry of Finance and the Vienna Institute for International Economic Studies (wiiw) organized an international expert seminar dealing with these issues in June 2010. The report starts with a summary of deliberations at the Vienna seminar. Next, the background study on the Ukraine's current economic and political situation, prepared for the seminar by wiiw (Vasily Astrov) is presented. The background study is followed by two contributions on future challenges from leading Ukrainian scholars (Igor Burakovsky and Vasily Yurchyshyn). Last but not least, reflections on Ukraine's-EU political and economic relations by Grzegorz Gromadzki, independent expert from Warsaw, are included as well. 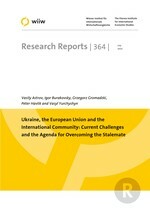 An extensive annex with recent statistical data on Ukraine is enclosed.